HE Mattar Al Tayer, Director-General and Chairman of the Board of Executive Directors of the Roads and Transport Authority (RTA), announced that the completion rate had reached 85% on the construction of the Bluewaters Island Access Bridges opposite to the JBR. The project, which is undertaken by the RTA in conjunction with Meraas Holding Group at a cost of AED 475 million is set for completion in December this year. “The project, which is nearing completion, aims to construct bridges leading to Bluewaters Island linked with the JBR Interchange 5.5 on the Sheikh Zayed Road. Bridges providing access to the Island comprise of a main bridge of two lanes in each direction stretching 1400 meters in length and 25 meters in width. The bridges include two lanes of 5.5 meters in width designated for the planned Automated Personal Rapid Transit System to ease the mobility of visitors from and to the metro station (Nakheel Harbour & Tower) on the Sheikh Zayed Road nearby the Island. The project also includes the construction of ramps and a two-lane bridge from Dubai to the Island, and a single-lane ramp from Al Khail Road to the Island as well,” stated Al Tayer. “The bridges would provide free movement for motorists inbound from Abu Dhabi on the Sheikh Zayed Road heading towards Bluewaters Island, and those inbound from Al Khail Road through Qarn Al Sabkha Street heading towards the Island. 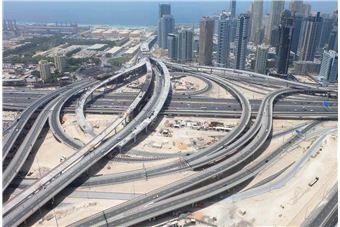 It would also provide seamless traffic movement from the Island to Dubai and Abu Dhabi via the Sheikh Zayed Road. Project construction works also include road connections, lighting, bridges and other infrastructure works such as the shifting of impacted utility lines, as well as the construction of new ones for power, water, irrigation, sewage, and telecommunications among others,” explained Al Tayer. “The new bridge meets the needs of Bluewaters Island overlooking the JBR, which promises to be one of the most attractive tourist destinations in the UAE. The Island – set to become home to the world’s largest Ferris wheel (Dubai Eye) – will host demarcated retail, residential, hospitality and entertainment zones. It will also host a boutique five-star hotel and varied residential options in addition to a bespoke ‘souq’ encircled by a promenade that will boast alfresco dining outlets serving a wide variety of cuisine. The Island is anticipated to attract more than three million visitors per annum. “The project would be served by an automated personal rapid transit system to lift visitors from the metro station to the festivities area, a footbridge would be constructed to link the Luxury Island with the waterfront of the JBR, and a teleferic (cable car) would be in place to shuttle visitors from and to the entertainment zone,” added Al Tayer.